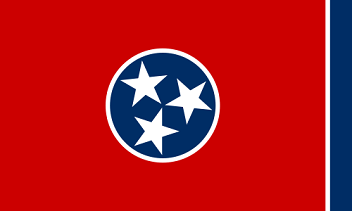 The State Flag official Tennessee depicts a predominantly red field edged with a narrow vertical white stripe and broader vertical blue stripe. The center circle displays three 5 pointed stars to represent the three different regions of the state of Tennessee: West, Middle, and East. The Tennessee flag serves as a symbol of honor, heritage and regional pride and is displayed at state buildings. There is an Order of Precedence for flags. State Flags are displayed in order as they entered the Union. Car Flags are often displayed to represent of an individual's allegiance to their state. Tennessee State car flags are used by their owners as mobile emblems of their home. Car flags are usually made from strong materials and are attached to a car via a pole and clip window attachment. What is the design of the Tennessee state flag? The design is an emblem on a field (background) of red, with a strip of blue on the fly. The emblem of the middle consists of three stars on a blue circle. What does the emblem symbolize? The designer of the flag, LeRoy Reeves, described his design explaining it would include three stars to represent the three grand divisions of the state. Reeves said "They are bound together by the endless circle of the blue field, the symbol being three bound together in one - an indissoluble trinity." What does the blue bar symbolize? The designer of the Tennessee flag, LeRoy Reeves, added the blue bar as a design consideration. He stated that "The final blue bar relieves the sameness of the crimson field and prevents the flag from showing too much crimson when hanging limp." Who designed the Tennessee State Flag? The name of the designer was LeRoy Reeves (1876-1960), captain of Johnson City's National Guard. Before his retirement in 1940, he advanced to the rank of colonel. What is the history of the Tennessee State Flag? What is the Tennessee Pledge of Allegiance and Salute? The Tennessee flag is kept and used as required by the code specified in the constitution of the state.